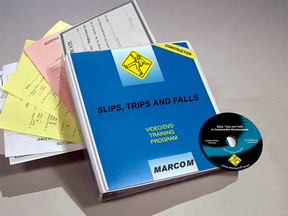 MARCOM's Slips, Trips and Falls in Construction Environments DVD Program shows employees the situations that can lead to slips, trips & falls in construction environments, and what they can do to avoid or prevent these accidents. Most employees don't give much thought to the prospect of slipping, tripping or even falling on the job. Yet these types of accidents account for more workplace injuries annually than any other accident category. Many of these injuries can be disabling... or even fatal. And because there is so much material, so many tools and pieces of equipment, and so much in the way of partially completed work, construction sites can be a virtual maze of slip, trip and fall hazards. The DVD includes information on the center of gravity and balance, trips and slips, walking surfaces, housekeeping and maintenance, footwear, how to fall properly, personal protective equipment, and more. The DVD program comes with a comprehensive leader's guide, reproducible scheduling & attendance form, employee quiz, training certificate and training log.